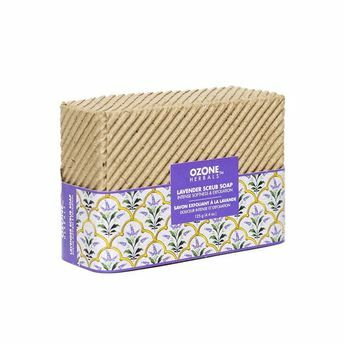 Enriched with Lavender oil, Ozone Herbals Lavender Scrub Soap soothes dry areas, while also gently exfoliating and sloughing away dead skin cells and dull buildup to begin revealing radiant 'new', healthier skin- It's the best of both treatments in a bar. This non-drying formula cleanses and refines without stripping skin of its natural oils, so your skin feels smoother with every use. This Bath bar naturally hydrates the skin, enhances luminosity and evens skin tone. It leaves skin renewed, brighter, soft, smooth and glowing.